A pterygium is an abnormal, noncancerous growth of the conjunctiva. The conjunctiva is a thin membrane lining the inside of the eyelid and part of the eyeball. It is located between the sclera, or the "white of the eye" which surrounds the eyeball, and the cornea, the dome-shaped window covering the front of the eye which is responsible for the refraction of light. If a pterygium continues to grow, it may spread onto the cornea. Excessive growth of the conjunctiva leads to a pterygium. The exact cause of pterygium is unknown. The symptoms of pterygia vary from person-to-person. It appears as a fleshy spot—whitish in color and containing blood vessels—extending onto the surface of the eye. In some people, pterygia remain small and do not affect vision. These pterygia are noticed only because of their abnormal cosmetic appearance. In other people, pterygia grow quickly and large enough to eventually distort the corneal surface and cause severely blurred vision. Pterygia do not cause pain. You will be asked about symptoms and medical history. An eye exam will be done. In rare cases, a pterygium causes serious scarring of the cornea. If this happens, a corneal transplant may be needed. Once the pterygium has been surgically removed, medication may be used to aid in healing and prevent recurrence. Wear dark glasses with UV protection to shield the eyes from sun, dust, and wind. Avoid harsh environmental factors to slow the growth or regrowth of pterygium. 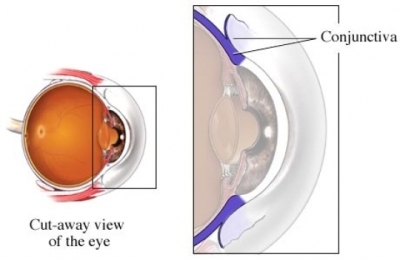 Facts About the Cornea and Corneal Disease. National Eye Institute website. Available at: https://nei.nih.gov/health/cornealdisease/. Updated May, 2016. Accessed December 15, 2017. Pterygium. Digital Journal of Ophthalmology website. Available at: http://www.djo.harvard.edu/site.php?url=/patients/pi/426. Updated October 15, 2002. Accessed December 15, 2017. Pterygium. EBSCO DynaMed Plus website. Available at: https://www.dynamed.com/topics/dmp~AN~T920562/Pterygium . Updated December 5, 2017. Accessed December 15, 2017. Pterygium. Kellogg Eye Institute, University of Michigan website. Available at: http://kellogg.umich.edu/patientcare/conditions/pterygium.html. Accessed December 15, 2017. What Is a pinguecula and a pterygium? American Academy of Ophthalmology Eye Smart website. Available at: https://www.aao.org/eye-health/diseases/pinguecula-pterygium. Updated September 1, 2017 Accessed December 15, 2017.